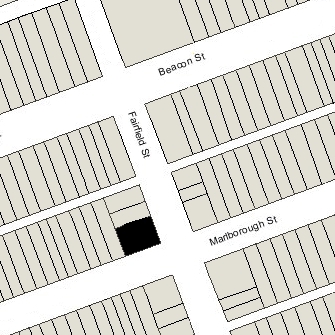 5 Fairfield is located on the NW corner of Fairfield and Marlborough, with 3 Fairfield to the north, 282 Marlborough to the south, across Marlborough, 12 Fairfield to the east, across Fairfield, and 285 Marlborough to the west. 5 Fairfield was built ca. 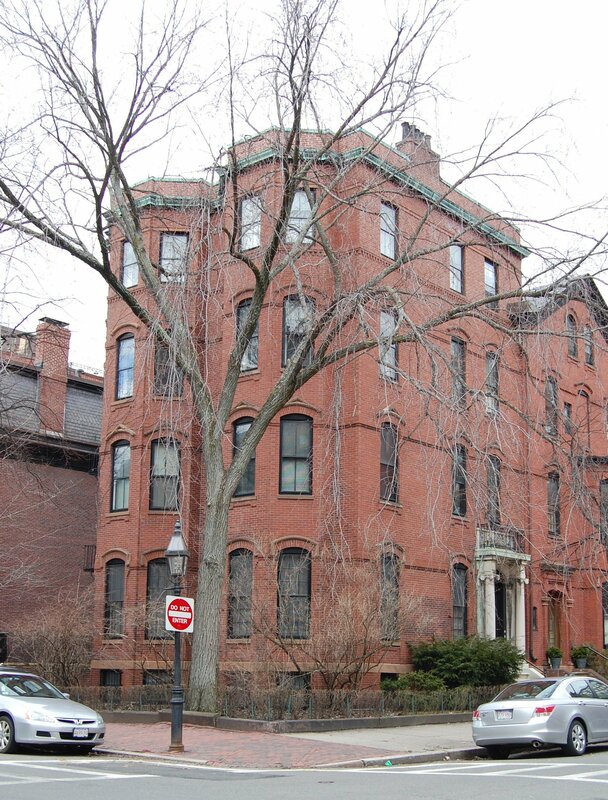 1870, one of three contiguous houses (1-3-5 Fairfield) built for investment banker Henry Chapman Wainwright for speculative sale. As originally built, both 1 Fairfield and 5 Fairfield had pitched roofs with dormers, and the three houses formed a symmetrical composition on Fairfield. Click here for an index to the deeds for 5 Fairfield. On May 21, 1871, 5 Fairfield was purchased from Henry Wainwright by retail clothier George Washington Simmons, Jr. 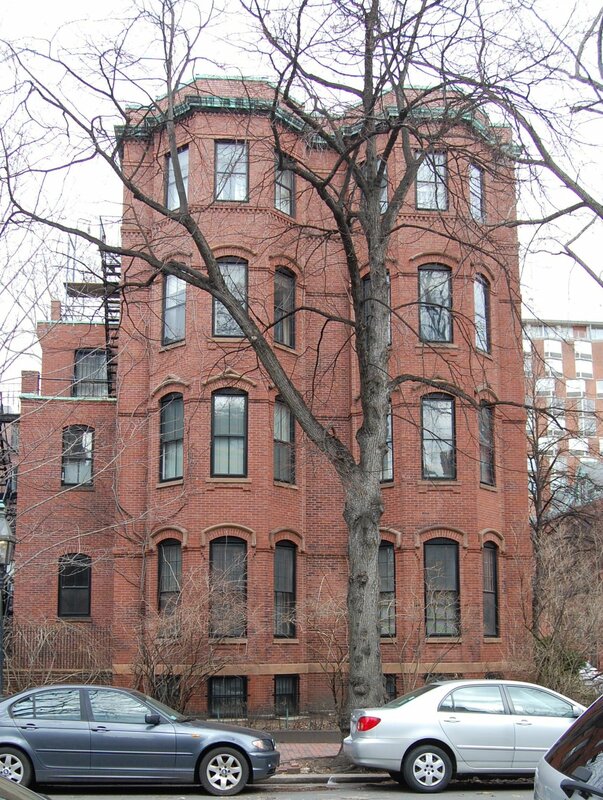 He lived at 6 Walnut with his parents, George Washington Simmons and Frances (Gay) Simmons. George Simmons married in September of 1871 to Mary Hamilton Parker and they made 5 Fairfield their home. 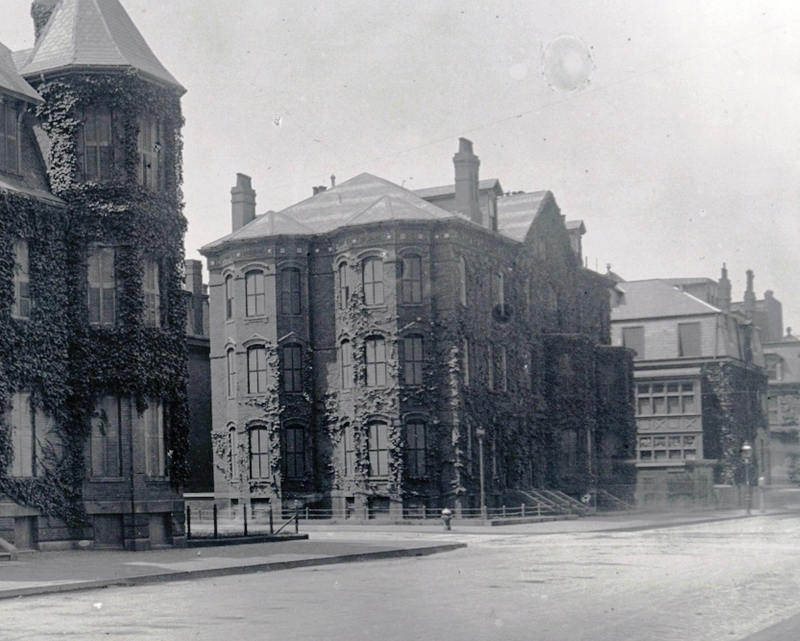 They continued to live at 5 Fairfield during the 1879-1880 winter season, after which they moved to the Hotel Vendome, where they remained until the 1883-1884 season, when they moved to 244 Marlborough. They also maintained a home in Nahant. By the 1880-1881 winter season, 5 Fairfield was the home of Augustus Lord Soule and his wife, Maria (Gray) Soule. They previously had lived in Springfield. He was an attorney and head of the law department of the Boston & Albany Railroad, and was a former Justice of the Massachusetts Supreme Judicial Court. Augustus and Maria Soule initially leased the house from George Simmons, Jr., but on April 23, 1883, Augustus Soule purchased the property from him. On July 1, 1887, 5 Fairfield was purchased from Augustus Soule by paper manufacturer Sumner Hollingsworth. Augustus Soule died the next month and Maria Soule moved to Brookline. Sumner Hollingsworth and his wife, Mary Clapp (Stevens) Hollingsworth, made 5 Fairfield their home. They had married in January of 1887 and previously had lived in South Braintree. They also maintained a home in Milton. Sumner Hollingsworth died in June of 1899. He died intestate and 5 Fairfield was inherited by his mother, Susan Jane (Sumner) Hollingsworth, the widow of Ellis Anderson Hollingsworth, and his brother, Ellis Hollingsworth. On August 29, 1899, they transferred the property to Mary Hollingsworth. Mary Hollingsworth continued to live at 5 Fairfield and in Milton. By 1905, she had been joined by her mother, Julia A. (Clapp) Stevens, who continued to live with her until her death in December of 1915. In 1913, Mary Hollingsworth filed for (and subsequently received) permission to construct a temporary tool shed “to facilitate alteration of present building.” The permit for the actual remodeling is not included in the Building Department’s files, but it may have included both exterior and interior changes (in July of 1913, she amended the permit to include the addition of a fire escape). In September of 1916, she applied for (and subsequently received) permission to remove the front steps and replace them with new stone steps. By the 1919-1920 winter season, Mary Hollingsworth had been joined by her sister, Miss Eleanor Barnard Stevens, and her niece, Miss Margaret Danforth, daughter of her brother-in-law and sister, Frederic and Carolina Augusta (Stevens) Danforth. Margaret Danforth was a bookbinder. By 1927, they had been joined by William Stoodley Bartlett Stevens, Mary and Eleanor’s unmarried brother. A retired banker, he previously had lived at 2 Mt. Vernon Place. 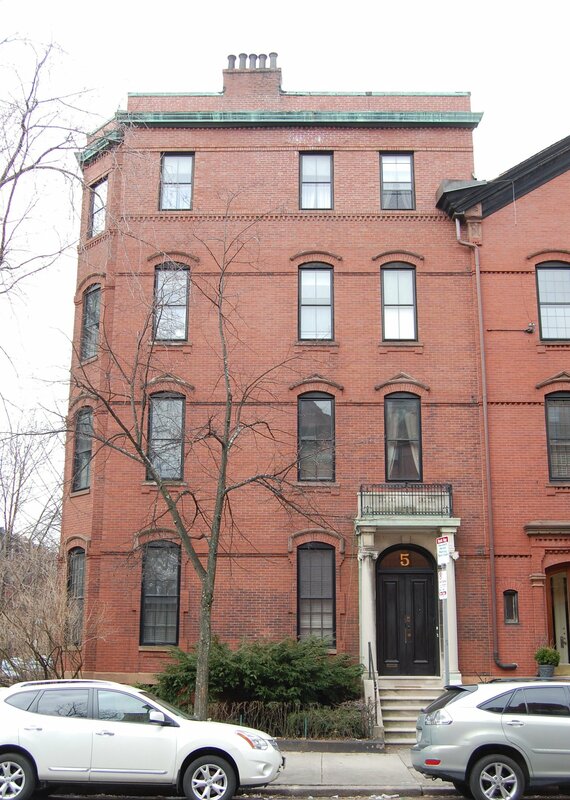 Margaret Danforth moved in about 1930 to 161 Newbury, the same address as the Sears School of Bookbinding. William Stevens died in April of 1930, and Eleanor Stevens died in April of 1935. Mary Hollingsworth continued to live at 5 Fairfield during the1936-1937 winter season, after which she made Milton her year-round home. It may have been at this time that the house was remodeled to eliminate the pitched roof and create a full fourth floor (the house is shown as being 3-1/2 stories on the 1928 Bromley map and as 4 stories on the 1938 map). 5 Fairfield was shown as vacant in the 1938-1940 City Directories. In November of 1939, Mary Hollingsworth filed for (and subsequently received) permission to convert the property from a single-family dwelling into a lodging house. On October 21, 1940, 5 Fairfield was purchased from Mary Hollingsworth by Annie (MacKinnon) Hardy, the wife of Hugh Hardy, who operated it as a lodging house. They previously had lived at 338 Commonwealth. 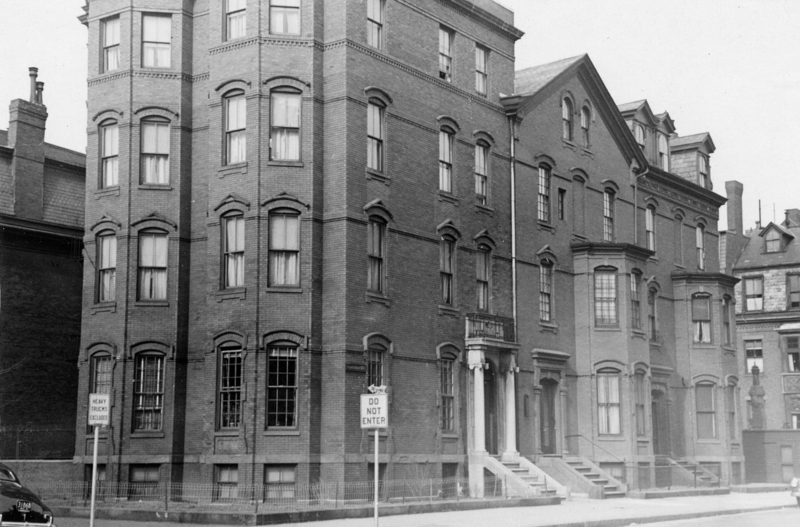 He was a butler and later would become a manager with the First National Bank of Boston. By 1942, they had moved back to 338 Commonwealth. On April 15, 1942, 5 Fairfield was acquired from Annie Hardy by Frank Lewis Rumney. He was a widower and lived in Cambridge. 5 Fairfield became the home of Miss Lillian Mary Landy, who operated it as a lodging house. She previously had lived at 10 Clearway. By 1946, Frank Rumney had moved to 5 Fairfield. Lillian Landy also continued to live at 5 Fairfield and manage the lodging house. In July of 1951, Frank Rumney married again, to Christine I. Ferry, a teacher in Springfield. After their marriage, they lived in Springfield and at 5 Fairfield. Lillian Landy also continued to live at 5 Fairfield until about 1956, when she moved to an apartment at 443 Beacon. On August 18, 1958, 5 Fairfield was purchased from Frank Rumney by attorney Henry H. Davis and his wife, Virginia Mildred (Nason) Lyons Davis. They lived in an apartment at 308 Commonwealth. The property changed hands, remaining a lodging house until the early 1960s. On August 11, 1964, 5 Fairfield was acquired by Chamberlayne School and Chamberlayne Junior College, located at 128 Commonwealth, and the property became a dormitory for the school. In the mid-1970s, Chamberlayne went bankrupt and on June 16, 1975, it transferred 5 Fairfield to Bernard P. Rome, trustee in bankruptcy. On August 29, 1975, 5 Fairfield was purchased from Bernard Rome by Eric Dluhosch and his wife, Katalin M. Dluhosch. Earlier that month, Bernard Rome had filed for (and subsequently received) permission to convert the property from a lodging house into four apartments. On the application, he noted that he was acting on behalf of Eric and Katalin Dluhosch. Katalin Dluhosch died in February of 2013. On August 7, 2013, 5 Fairfield was purchased from Eric Dluhosch by XINQIAO (USA) Corporation. It remained an apartment building, assessed as a four-to six-family dwelling, in 2017.